Winter must be cold. Not mild, damp and grey. I like it to be cold, clear and crisp. Waders and wildfowl on the estuary. Frost should not be feared, slip on another jumper and get outdoors. Summer should be roasting. I'm cool with hosepipe bans as it means summer is doing what it should. Endless days of light and heat. Butterflies and dragonflies on the wing. Brilliant. This year, as far as I am concerned, autumn has lived up to it's billing. Windy, with showers of rain zipping by and giving a swift soaking. Warm sunshine before cool nights, an occasional suggestion of frost. The clocks going back are a sign for many that winter is just around the corner but it's something else for me. 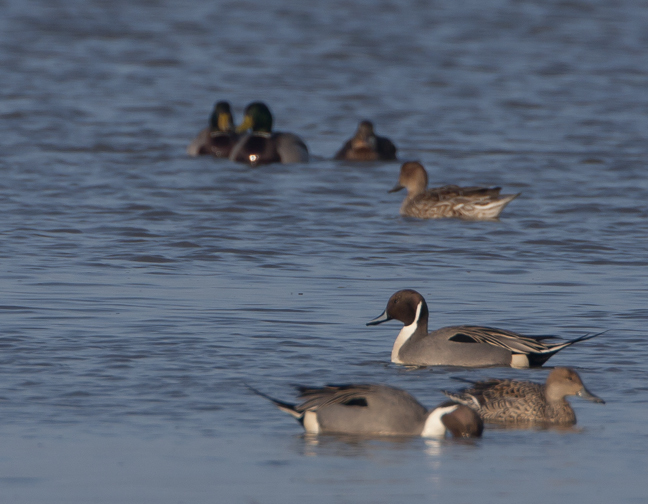 The arrival of Pintails is the clearest signal to me that the chilly season is upon us. The first few start to arrive during the latter part of October and numbers will build up until they reach over 5000 on the estuary as a whole, you can usually catch up with a fifth of that number in the gutter by Thurstaston Beach. 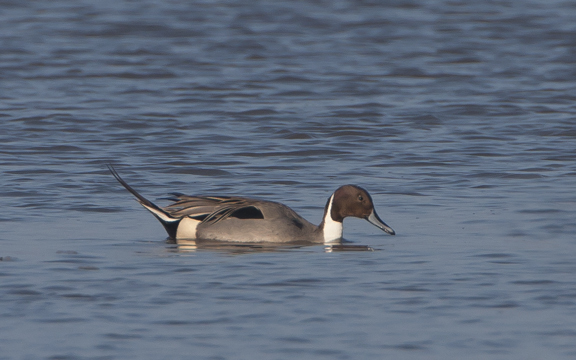 That is where I was a couple of days ago when I spotted my first Pintails of the season. 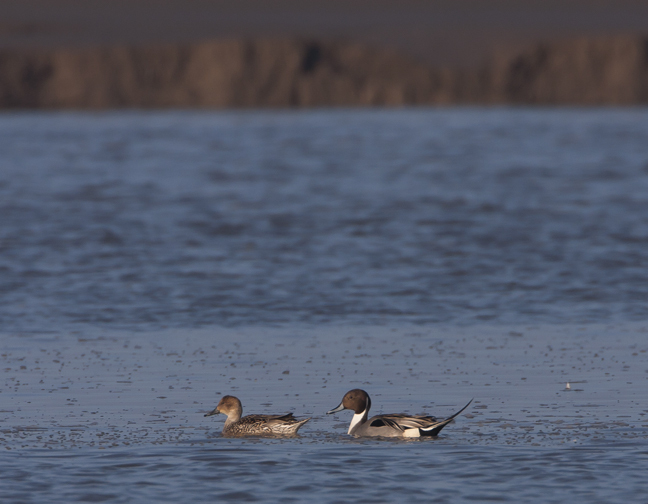 Mallards were mooching about as usual but a second glance at the raft of ducks dabbling in the swashing incoming tide revealed some fine Pintails. For a while there is an uneasy stand off (or should that be swim off?) between the two duck species. The resident Mallards seem a little wary of the newcommers. It soon settles down to a relaxed state of detente. The males are looking fine after moult, choclatey brown heads and silvery bodies leading to their characteristic tale plume. The females are all muted browns scalloped wit black edges, still attractive in an understated way. Some of the group of 30-odd still seem to be in pairs despite the end to the breeding season. The male still seems protective of her, he chases off other drakes if they get too close. The tide is filling the gutter, spilling over the muddy edges and flooding the mudflats. Redshank and Dunlin are feeding here and are disturbed from their meals by the water. 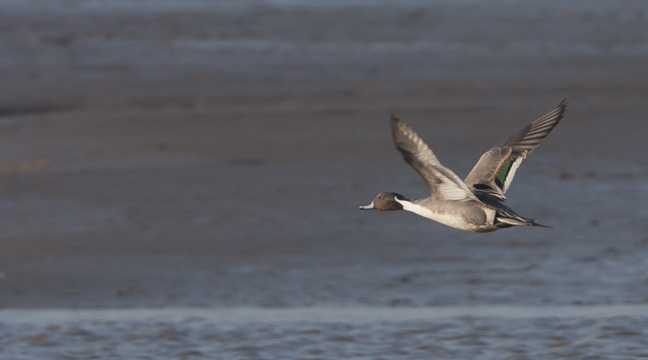 They fly off towards the marshes at Heswall seeking refuge from the advancing tide. 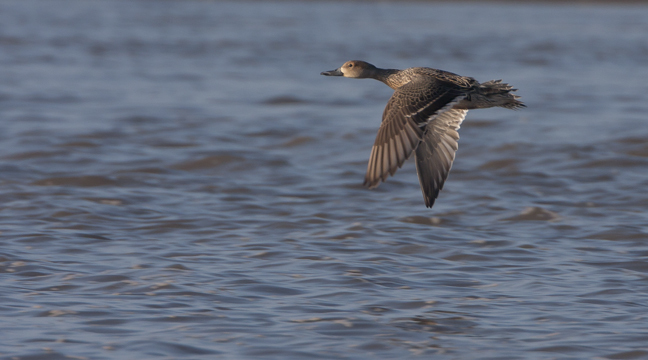 The female Pintail follows their lead and takes flight. The male is up and off after her almost immediately, he is either very possessive or well under the thumb! They splash down in the gutter further up where the tide is yet to flood and hoot to each other. They resume feeding and drift on the quickening current that will deliver them to the marsh and reunite them with the now roosting Redshank. The whole episode lasts about 10 minutes then they are out of sight. The first encounter with my harbinger of winter was a brief one but I know it is now time to rediscover the hats and scarves that summer consigned to the deepest recesses of the wardrobe.